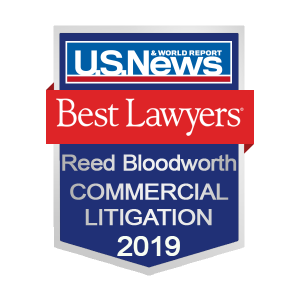 U.S. News & World Report and Best Lawyers announced the release of the “Best Lawyers” rankings and Florida attorney L. Reed Bloodworth was named to the Best Lawyers list for his work in Commercial Litigation. Attorneys included in the 2019 Edition of Best Lawyers are recognized for professional excellence with consistently impressive ratings from peers and clients. The 2019 rankings are based on the highest number of participating firms and highest number of client votes received on record. To be eligible for a ranking, a firm must have a lawyer recognized first in The Best Lawyers in America, which recognizes the top five percent of practicing attorneys in the U.S.
“We reviewed 14,643 lawyers throughout the United States – across 75 national practice areas – and Reed Bloodworth received a national lawyer ranking,” said Phil Greer, CEO of Best Lawyers. Over 16,000 lawyers provided more than 1,125,000 lawyers assessments, and almost 12,000 clients provided more than 107,000 evaluations. 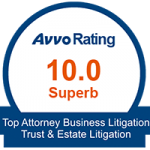 Lawyers achieving this ranking demonstrate a unique combination of quality law practice and breadth of legal expertise. “U.S. News has more than 30 years of experience evaluating complex institutions and their service to consumers,” said Tim Smart, executive editor at U.S. News. General Counsel Publication, which will be distributed in November to more than 30,000 in-house counsel, and in digital format to more than 60,000 private practice lawyers worldwide. The U.S. News Best Lawyers® rankings are based on a rigorous evaluation process that includes the collection of client and lawyer evaluations, peer reviews from leading attorneys in the field, and review of additional information provided by lawyers as part of the formal submission process. To be eligible for a 2019 ranking, a lawyer must have at least one lawyer recognized in the 24th Edition of The Best Lawyers in America list for that particular location and specialty. Celebrating its 85th year, U.S. News & World Report is a digital news and information company that empowers people to make better, more informed decisions about important issues affecting their lives. Focusing on Education, Health, Money, Travel, Cars and Civic, USNews.com provides consumer advice, rankings and analysis to serve people making complex decisions throughout all stages of life. More than 40 million people visit USNews.com each month for research and guidance. Founded in 1933, U.S. News is headquartered in Washington, D.C.
Best Lawyers is the oldest and most respected attorney ranking service in the world. For more than 30 years, Best Lawyers has assisted those in need of legal services to identify the attorneys best qualified to represent them in distant jurisdictions or unfamiliar specialties. Best Lawyers lists are published in leading local, regional, and national publications across the globe. The Best Lawyers in America list recognizes the very best lawyers in each practice area and metropolitan region in the country.